Josh Peckler - Jpeckler@shawmedia.com Huntley running back Ethan Connor (4) tries to escape from Cary-Grove defenders Matt Hughes (left) and Mickey Duncan during the fourth quarter at Cary-Grove High School Saturday, October 6, 2012. Cary-Grove defeated visiting Huntley 41-14. Josh Peckler - Jpeckler@shawmedia.com Huntley quarterback Kameron Sallee looks down field for a open receiver during the third quarter at Cary-Grove High School Saturday, October 6, 2012. Cary-Grove defeated visiting Huntley 41-14. Josh Peckler - Jpeckler@shawmedia.com Huntley's Tyler Schwartz (8) is hit by Cary-Grove's Emerson Kersten during the third quarter at Cary-Grove High School Saturday, October 6, 2012. Cary-Grove defeated visiting Huntley 41-14. Josh Peckler - Jpeckler@shawmedia.com Cary-Grove's Matt Hughes (38) tries to tackle Huntley running back Ethan Connor during the third quarter at Cary-Grove High School Saturday, October 6, 2012. Cary-Grove defeated visiting Huntley 41-14. Josh Peckler - Jpeckler@shawmedia.com Cary-Grove's Kasey Fields (22) runs with the ball while being chased by Huntley's Brandon Mabry during the third quarter at Cary-Grove High School Saturday, October 6, 2012. Cary-Grove defeated visiting Huntley 41-14. Josh Peckler - Jpeckler@shawmedia.com Huntley's Jake Scalise (31) is tackled by several Cary-Grove defenders during the third quarter at Cary-Grove High School Saturday, October 6, 2012. Cary-Grove defeated visiting Huntley 41-14. Josh Peckler - Jpeckler@shawmedia.com Cary-Grove's Brain Nordengren (27) tries to grab Huntley's Bryce Beschorner as he runs with the ball in the fourth quarter at Cary-Grove High School Saturday, October 6, 2012. Cary-Grove defeated visiting Huntley 41-14. 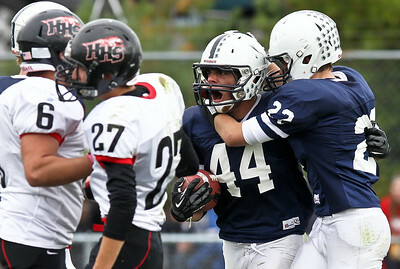 Josh Peckler - Jpeckler@shawmedia.com Cary-Grove's Kyle Norberg (44) celebrates with teammate Kasey Fields after he ran for a 66 yard touchdown during the third quarter at Cary-Grove High School Saturday, October 6, 2012. Cary-Grove defeated visiting Huntley 41-14. Josh Peckler - Jpeckler@shawmedia.com Huntley's Jake Lackovic is pulled down by Cary-Grove's Marcus Thimios during the fourth quarter at Cary-Grove High School Saturday, October 6, 2012. Cary-Grove defeated visiting Huntley 41-14. Josh Peckler - Jpeckler@shawmedia.com Huntley's Garrick McDaniel reaches up to catch a ball while being covered by Cary-Grove's John Walker during the third quarter at Cary-Grove High School Saturday, October 6, 2012. Cary-Grove defeated visiting Huntley 41-14. Josh Peckler - Jpeckler@shawmedia.com Huntley's Josh Sepsey jumps over Cary-Grove's Ethan Connor after breaking up a pass during the third quarter at Cary-Grove High School Saturday, October 6, 2012. Cary-Grove defeated visiting Huntley 41-14. 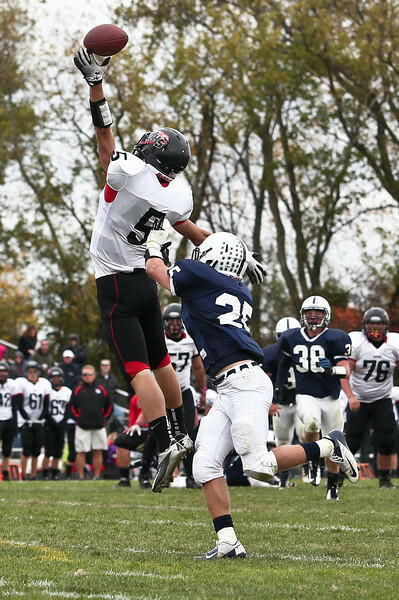 Huntley's Garrick McDaniel reaches up to catch a ball while being covered by Cary-Grove's John Walker during the third quarter at Cary-Grove High School Saturday, October 6, 2012. Cary-Grove defeated visiting Huntley 41-14.